Department of Design and Construction Commissioner Feniosky Peña-Mora will step down from his post, sources said. NEW YORK CITY — The embattled head of the city's design and construction office, which oversees the problem-plagued Build it Back program, will step down from his post at the end of the month to return to Columbia University, the mayor announced. Department of Design and Construction Commissioner Feniosky Peña-Mora's departure was first reported by the Wall Street Journal Tuesday night. Peña-Mora — who was the former dean of Columbia University's engineering department — is leaving his post to return to the university as a professor, Mayor Bill de Blasio said Wednesday. "I deeply appreciate Feniosky Peña-Mora’s extraordinary service to New York City," de Blasio said in a statement. "While I am sorry to see him go, we did know this day would come. Indeed, he put off his return to Columbia, where he is a tenured professor, for an additional year to continue to serve the city." Peña-Mora wrote in a farewell email to staff obtained by DNAinfo New York that his leave from Columbia to head the DDC was originally supposed to be for two years, but that it was extended by a year at de Blasio's request. "It has been my great honor to work with each and every one of you, and I will always cherish my days leading this wonderful agency," Peña-Mora wrote in the email. "We have enjoyed a great many successes and taken on numerous new challenges, making the last three years one of the most dynamic periods in DDC history." ​The DDC oversees construction and renovation of all of the city's public buildings, such as libraries and police precincts. Despite the numerous complaints from elected officials and politicians about the delay-prone agency, Peña-Mora's farewell email was filled with glowing praise for the agency, mentioning how many awards it has won and how the department has streamlined processes. "Together we’ve also made great strides in project delivery, processing record numbers of payments and change orders faster than ever, which means we’re working more efficiently for our clients, consultants, and contractors," Peña-Mora wrote. "The agency’s successes have led to City government placing more faith in it, and adding new responsibilities." De Blasio said his office is currently seeking a replacement for him. Peña-Mora previously came under fire at the DDC for hiring a councilman's wife and awarding city contracts in exchange for good PR. 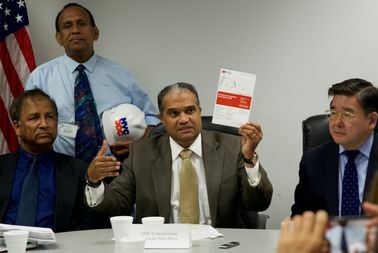 The agency has been criticized by residents and politicians for its handling of the "failure" of the Build it Back program to get Hurricane Sandy victims back in their homes, ballooning costs on some facilities and delays to many projects. Staten Island Borough President James Oddo, a vocal critic of the agency, even created an online game where Staten Islanders can guess if a project will come in under or over the DDC's projected completion.